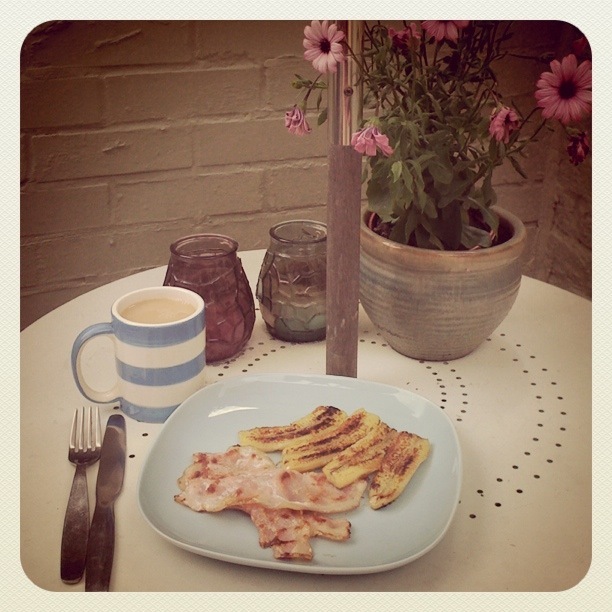 You won’t believe this (how many posts are going to start with that, maybe I should dedicate a category to ‘you won’t believes’) but the salty smokey bacon and sweet sticky banana combination gives me such a feeling of happiness. Introduced to me by my partner’s father, I didn’t believe it would work. It does. 1. peel and slice the banana down the middle and into quarters. 2. lightly fry the bacon and banana slices in the same pan in a little olive oil, not too fast so, you don’t want to burn the outside of the banana. 3. serve with freshly ground black pepper and a cup of Yorkshire tea.